Phil at Make has developed a mod for the Kill-A-Watt power meter: Tweet-a-Watt transmits your daily power usage to Twitter via PC, so friends and strangers will know you're a smug, super-green SOB. The Kill-A-Watt is already one of my favorite toys, capable of telling me just how much of a juice hog the Pioneer first-gen Kuro plasma is when compared to any LCD anywhere ever (about twice), or the PS3 is when compared to a standard Blu-ray player (10X or more). What our buddy Phil Torrone and Limor Fried of Adafruit have done as an entry in Core77's Greener Gadgets competition is made it useful as a tracker, or maybe a bragger. 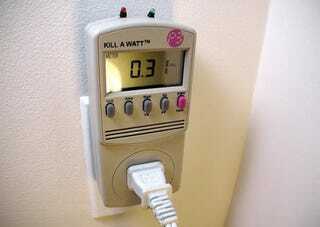 When it gets a reading of your daily KWH usage, it blasts it via Xbee wireless transmitter to a PC "or internet-connected microcontroller, like an Arduino." (I did mention Phil Torrone came up with this, didn't I?) From there, it's just an easy hop from your Twitter account. We feel there is a social imperative and joy in publishing one's own daily KWH - by sharing these numbers on a service like Twitter users can compete for the lowest numbers and also see how they're doing compared to their friends and followers.